Despite my short hair and my propensity for comparing myself to a 14 year old boy, I am in fact a big fan of what we’ll call “feminine” dressing. I mean, technically everything I do is feminine, as I am in fact female. Technically I could strip an engine, chug a beer, burp hugely and still be being feminine (and hey, it’s still the weekend as I write this, so who knows!). But you know what I mean here – I mean pretty, ladylike dressing. I mean this vintage pink and grey dress under a tree in full bloom. This particular dress is from The Dressing Room in New Plymouth, and is a Southwell of Auckland design. Southwell opened in 1953 and remained in the NZ fashion game until 1986, but I’m pretty sure this is from early in that lifespan. Feel free to correct me! Considering its age (I mean, it’s got to be older than I am and I’m looking pretty rough already) it’s in great shape, with some minor staining on the belt. As an interesting aside, this little number is a size 11. The 70s vintage dress I bought is a size 12. Both fit me, a modern size 6, pretty well (once again, my lack of a chest does make this a little loose in the bodice, but that waist band was made for me). I think we’ve proven vanity sizing is a thing. Now, I’m not a true vintage aficionado – yet. Apparently I’m working on it. Part of the issue is my concern that I’ll end up looking like I’m in costume (as opposed to just thinking of my clothes as a costume that let me signal who I am on a particular day). I don’t want to look like I’m wearing a dress up version of something, so I look for one of two things in my vintage: it’s clearly authentic vintage to the casual observer, per this, or it’s come around the block again and looks modern and fresh again (I’ll show you an example of this next week). This dress doesn’t look like a Glassons knock off, thanks to the fabric, cut and details. I get asked about my clothes a fair bit, and I doubt anyone would be surprised to hear this was vintage. I also only buy vintage to wear (again, so far), so it has to be something I think flatters me and has a place in the fairly competitive space that is my wardrobe(s). I love the open, neck-lengthening collar on this dress that is pleasingly symmetrical, the perfect sleeve length (although it doesn’t quite cover the little pudgy bit above my elbow. What is that pudge??) and the belted waist. Look at all the fabric in that skirt! If you don’t feel like a fulltime babe wearing this dress, you aren’t me. Regardless of how pleasing I find a vintage dress, it also has to work with the stuff I wear that isn’t vintage. I need this dress to be the silver fox to my modern wardrobe’s early 30s career woman. Choose something that genuinely suits you and your lifestyle. Do not buy a boho dress if you are not boho. Do not buy a crazy leather jacket from the 80s if you are very shy. You will look like an idiot simply because you look so uncomfortable. Do the standard fashion mixing, as in this case, very girly dress + leather jacket. I’ve talked about this before, but in this case it serves to dilute the vintage-ness a touch. Put on aggressive lipstick and some kind of very “now” accessory. In this case, I went with mirrored sunglasses, but statement earrings (extremely “now”) would also be a great option. This drags you forward a bit from the era of your outfit. Wearing this dress on a picnic is one thing, but the real question, as always, is would I wear this dress to work? It certainly hits my de minimis “can’t see up it, down it or through it” rule. It’s certainly a lot spiffier than what the boys in IT are wearing, so no problem with hitting the wrong note there, either. My workplace doesn’t have a dress code, to my amazement, so as long as what I wear hits a basic level of “not naked”, the rest of my standard of dress is down to me. However, this dress is a little too “picnic in the park” for me – I feel like I should be buying my groceries in brown paper bags and mixing martinis at 5pm. No problem though! I’ll just schedule a bunch of picnics this summer, bake some cookies from scratch, and let this dress live its truest life. 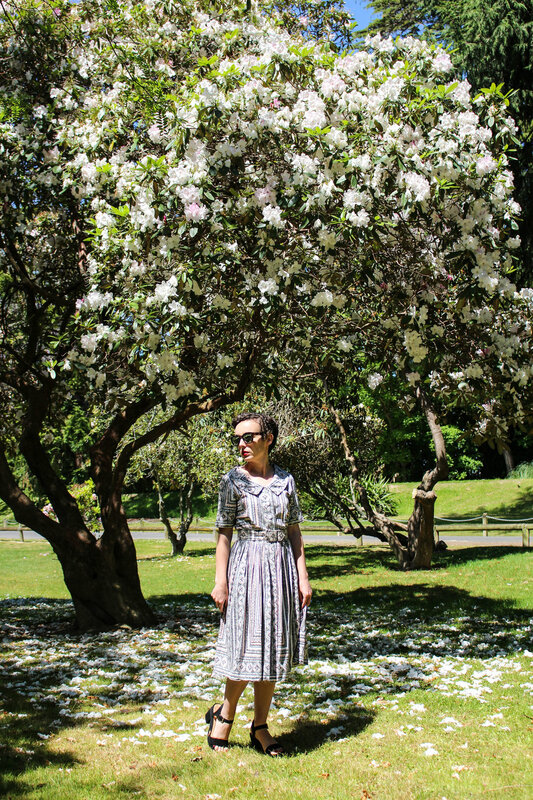 Dress: vintage, but there are so many on TradeMe, including here, here, here, here and here. Jacket is my trusty Blak Luxe Evermore jacket. I bought this nearly a year ago, on sale, and I would estimate I'm easily down to $1 per wear - an investment worth making. Shoes are Therapy from last year (no longer available) and my sunglasses are from Le Specs. Again! I must wear some of my other options.